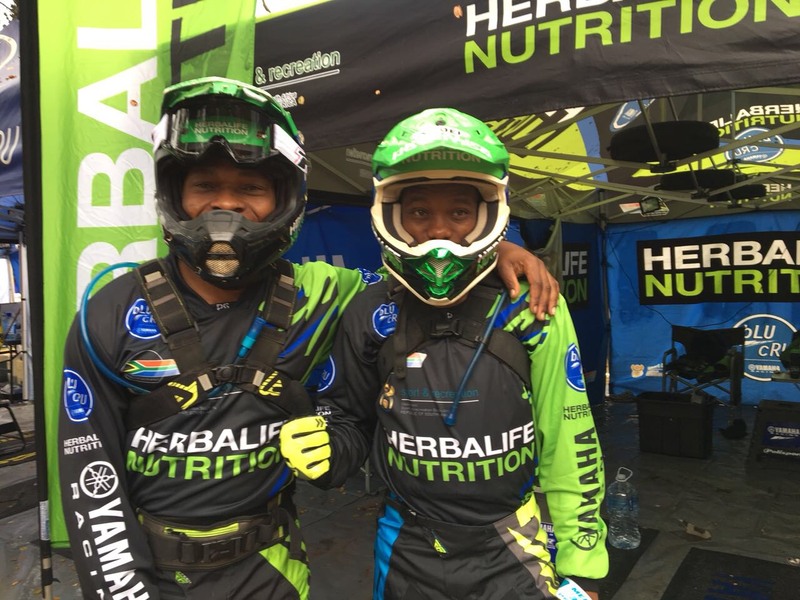 Johannesburg, South Africa, 29 November 2018 – Herbalife Nutrition bLU cRU Yamaha Racing Team stars, Thabang Katees and Piwe Zulu, both ended among the top 10 at the recently held Powasol Nite-X2; their last race before taking to the 2018 Motul Roof of Africa. Piwe placed 8th with Thabang not far behind him in 10th position, for the expert-class. The race, a popular urban showcase with riders taking on an extreme enduro track at night, is the 6th round of the Southern Africa Endurox Series. “I enjoyed the race very much and was optimally tested as the intensity increased with every lap. I also thoroughly enjoyed riding bar to bar with my Herbalife Nutrition bLU cRU Yamaha Racing Team mate, Thabang, and some of the other pro riders,” says Piwe. With his sight set on the upcoming Motul Roof of Africa next week, Piwe now focusses on the last of his training and avoiding possible injury as he plans to better his results obtained at last year’s race. “The atmosphere is great at Nite-X and I feel fortunate to have finished among the top 10 riders, I look forward to favorable results at the Motul Roof of Africa for myself and Piwe after an intense year of training and races like this,” says Thabang. The Motul Roof of Africa will take place from 5-8 December 2018 where the duo will compete with riders from across the globe in the Silver class. The race held in the Mountain Kingdom of Lesotho, is considered one of the toughest off-road endurance events in the world. This is the second time the Herbalife Nutrition bLU cRU Yamaha Racing Team will be competing in the Roof. Reflecting on a successful year of racing, the riders attribute their achievements to sponsorship involvement and the building of their physical and mental stamina through many hours of training in the saddle and in the gym. “Being a professional rider has been a lifelong dream that finally became a reality for me last year and it would not have been possible without sponsors like Herbalife Nutrition as well as my mentors and training partners who believe in me,” says Piwe. Thabang adds to that by emphasizing the importance of mental fitness and solid nutritional support and thanks those who helped him stay motivated during the year. “We are extremely proud of Thabang and Piwe and their accomplishments this year. We wish them all of the best with the Motul Roof of Africa ,” says Thilo Naidoo, Herbalife Nutrition Country Director, Southern Africa. Herbalife Nutrition is a global nutrition company whose purpose is to make the world healthier and happier. The Company has been on a mission for nutrition - changing people's lives with great nutrition products and programs - since 1980. Together with our Herbalife Nutrition independent distributors, we are committed to providing solutions to the worldwide problems of poor nutrition and obesity, an aging population, skyrocketing public healthcare costs and a rise in entrepreneurs of all ages. Herbalife Nutrition offers high-quality, science-backed products, most of which are produced in Company-operated facilities, one-on-one coaching with an Herbalife Nutrition independent distributor, and a supportive community approach that inspires customers to embrace a healthier, more active lifestyle. Herbalife Nutrition’s targeted nutrition, weight-management, energy and fitness and personal care products are available exclusively to and through its independent distributors in more than 90 countries. Through its corporate social responsibility efforts, Herbalife Nutrition supports the Herbalife Nutrition Foundation (HNF) and its Casa Herbalife programs to help bring good nutrition to children in need. Herbalife Nutrition is also proud to sponsor more than 190 world-class athletes, teams and events around the globe.